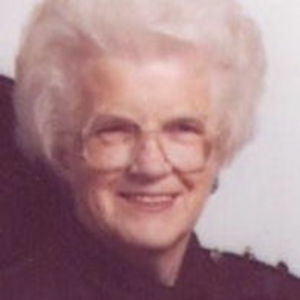 Surrounded by loved ones, the sweet and gentle spirit of Doris Lavonne Adam, age 85, of Bath, Indiana (formerly of Wahpeton, North Dakota) went home to be with her Lord on October 5, 2013. The Funeral Service will be Friday, 11:00 a.m., at Immanuel Lutheran Church, Wahpeton, with Rev. Morris Stephens officiating. Visitation will be from 9 am until the time of service at the church on Friday. Interment will be at Fairview Cemetery, Wahpeton. Vertin-Munson Funeral Home, Wahpeton, is in charge of arrangements. Born October 24, 1927 in Harvey, North Dakota she was the daughter of the late Newell & Alice (Lindelin) Bjorke. On November 11, 1945 she was united in marriage to Warren R. Adam, and he preceded her in death on January 16, 1997. Doris was a retired Beautician, having worked for many years at Deluxe Beauty Shop in Wahpeton. She and her husband had also owned and operated the Tastee Freeze in Devils Lake. She was a member of Immanuel Lutheran Church in Wahpeton; a former member of St. Peters Lutheran Church in Devils Lake, North Dakota; the Ladies Aid Society as well as the Crafty Ladies. She was also a member of the Brookville Road Baptist Church in Indiana. Doris enjoyed auction sales, playing cards, gardening, crafting, quilting, and was a talented seamstress and a phenomenal cook. She loved her God, family, friends and her church families, however, her greatest joy was time spent with her family. Survivors include two daughters, Judy (Roy) Harvey of Brookville, Indiana, Janet (Marvin) Goss of Richey, Montana; two sons, Dwight Adam of Fergus Falls, Minnesota and Bruce (Sandy) Adam of West Fargo, North Dakota; a brother, Merlin (Bud) Bjorke of Minneapolis, Minnesota; 11 grandchildren, Cory (Rebecca) Gerrells, Christa (Pennie) Hendrickson, Melanie Gross, Tiffany (Adam) Sebek, TJ (Dana) Goss, Marcus Goss, Warren (Jessica) Adam, John David Adam, Austen Adam, Ron (Clarissa) Harvey, Brian Harvey; 15 great-grandchildren, and one great-great grandchild. Besides her parents and husband, Warren, she was preceded in death by a son, David Adam; a son-in-law, John Robertson, two brothers, Carroll and Norton Bjorke; as well as a great-grandson, Brandon Harvey. Memorial contributions may be directed to the American Cancer Society. To the Adams family, so sorry to see of your mothers passing. I have a lot of fond memories of being with your family as kids, your parents were great.May the good Lord grant you peace and comfort in this sad time.